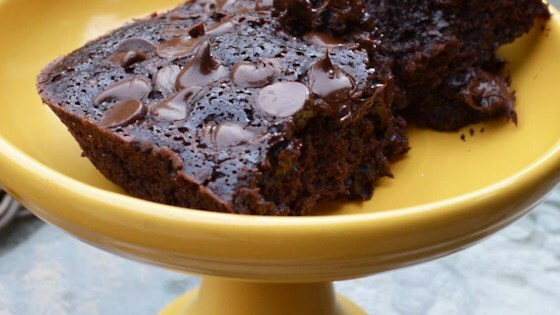 "You won't believe how chocolate-y and moist these brownies are. I like to make them in mini muffin cups with mini foil cupcake liners. Dust them with powdered sugar and you have a decadent treat with the benefit of more protein, more fiber, and fewer fat calories." Blend black beans and water together in a blender until smooth; pour into a bowl. Stir brownie mix into black bean mixture until batter is smooth; fold in 1/2 cup chocolate chips. Pour batter into prepared baking dish. Sprinkle remaining 1/2 cup chocolate chips over batter. Bake in the preheated oven until a toothpick inserted 2 inches from the side of the pan comes out clean, 25 to 27 minutes. Cool brownies completely on a wire rack before cutting into squares. Totally indulgent flourless brownie for any chocolate lover! I was totally surprised at how fudgy and moist these brownies were. My 8 year old grandson ate one, and loved it! I used A sugar free brownie mix because my husband is diabetic, and it was great. Very good! As a personal preference, I mixed all my chips into the batter. Almost tastes like there's pudding in the mix.